Our favorite pizza place in Northern California is a place called Napoli (located in Vallejo, Benicia & Vacaville). Their crust is perfection and they don’t skimp on toppings. 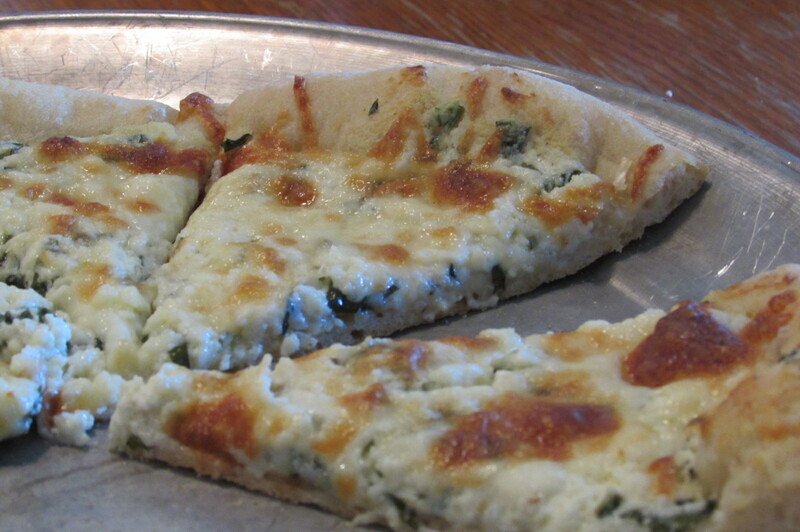 A recent menu addition at Napoli’s is a pizza called a Bianca, which comes with ricotta, feta, parmesan and mozzarella. The Bianca is quite tasty, but unfortunately Napoli is a 30-minute-$5-bridge-toll drive from my house. This brings us to my version of the Napoli Bianca. Make it with Trish’s awesome Neopolitan Style Pizza Crust recipe and enjoy super cheesy pizza perfection! Mix above ingredients together in a small bowl, then spread on pizza dough as the sauce layer. Over sauce, sprinkle approximately 1 cup of shredded mozzarella cheese. Then sprinkle with 1/3 cup feta cheese crumbles. Top with 1/4 cup Romano or parmesan cheese. Bake at a high temperature, 450-475 for 12-18 minutes, or until cheese begins to brown on top. Always allow pizza to cool at least 5 minutes before cutting & serving. Tags: Pizza Bianca, pizza with feta, pizza with ricotta, pizza without red tomato sauce, white pizza recipe. Bookmark the permalink. We enjoyed some of this pizza for lunch last week and it was amazing! Also super good left over! Yum! Used Bertolli Garlic Alfredo Sauce, didn’t use the olive oil, put it on some garlic flatbread which I had put fresh garlic on that I had sent through a garlic press. It was awesome!